Yesterday The Gateway Pundit reported that Senator Rand Paul announced Wednesday that according to a high level source, former CIA Chief John Brennan insisted Hillary’s fake Russia dossier be included in the Intelligence Report. In late summer of 2016, then-FBI Director James Comey was notified that former Senate Majority Leader Harry Reid would be sending him a letter asking him to investigate the Trump campaign’s alleged ties to Russia. Harry Reid’s letter was written a week after he met with John Brennan – raising suspicion that Brennan briefed Reid on the fake Steele dossier — Reid’s letter was then leaked to the New York Times just before election day. John Brennan told the House Intelligence Committee in a May 2017 hearing that the dossier was not a part of the intelligence used to assess Russian interference in the 2016 election. Former House Intel Chairman Devin Nunes was reportedly investigating whether Brennan perjured himself during his 2017 testimony to the Committee. Rand Paul is right — it’s time for Congress to drag Brennan in again and question him under oath ASAP. The total lack of integrity in some of our government officials and elected officials in appalling. Paul Farhi posted an article yesterday at The Washington Post about the media’s role in the Mueller investigation. Other news outlets defended their reporting as well, noting that much of it is undisputed and has led to indictments and guilty pleas by figures associated with Trump’s campaign. In fact, revelations by the Times and The Washington Post about contacts between Russian agents and Trump’s campaign advisers in 2016 helped prompt the inquiry that the special counsel took over in May 2017. The two newspapers shared a Pulitzer Prize for their reporting on the issue that year. Although the mainstream media tried to make this Watergate, it wasn’t, and I suspect they have little or no intention of admitting their misreporting of major aspects of the story. First of all, where was the reporting of the abuse of power by the Obama administration in surveillance of an opposition party political campaign? Second, where was the commentary on inflammatory statements by former intelligence officials that later proved to be wrong? Third, where was the commentary on the accomplishments of the Trump administration in trade, taxes, and economic policy? If you are still watching the mainstream media and believing what they say, you will continue to be misinformed and mislead. In 1964 a movie called “Seven Days In May” was released. The movie deals with a plot by United States military leaders to overthrow the President because he supports a nuclear disarmament treaty and they fear a Soviet sneak attack. Byron York posted an article at The Washington Examiner today about eight days in May 2017 when a politicized FBI and Department of Justice began their efforts to unseat a duly elected President. Much, if not all, of what McCabe reports has been reported before. But an eyewitness, insider account lends new weight to the idea that the highest levels of the national security apparatus experienced a collective freakout in the days after the Comey firing. In particular, it intensifies questions about Rosenstein’s behavior in those eight days. Remember that Rosenstein played a key role in the removal of Comey. A few days later, he was talking about removing the president for having removed Comey. The sheer audacity of that has stunned even experienced Capitol Hill observers. If we are to keep our free country and our election process, there are a number of people who need to be held accountable for their actions while they were in leadership roles in government organizations. Democratic senators vied with pop-up protestors in the U.S. Senate gallery to disrupt and, if possible, to derail the confirmation hearings of Supreme Court nominee Brett Kavanaugh. U.S. SenatorCory Booker (D-N.J.) played Spartacus, but could not even get the script right as he claimed to be bravely releasing classified information that was already declassified. I cannot remember another example of a senator who wanted to break the law but could not figure out how to do it. Elizabeth Warren (D-Mass. ), former Harvard Law Professor who still insists she is of Native American heritage, called for the president to be removed by invoking the 25th Amendment. Apparently fabricating an ethnic identity is sane, and getting out of the Iran deal or the Paris Climate Accord is insanity and grounds for removal. …To cut to the quick, the op-ed was published to coincide with the latest Bob Woodward “according-to-an-unnamed-source” exposé, Fear. The intent of anonymous and the New York Times was to create a force multiplying effect of a collapsing presidency—in need of the Times’ sober and judicious handlers, NeverTrump professionals, and “bipartisan” Democrats of the sort we saw during the Kavanaugh hearing to “step in” and apparently stage an intervention to save the country. Had the Woodward book not been in the news, neither would be the anonymous op-ed. And of course, the Times, in times before 2017, would never have published a insurrectionary letter from an unnamed worried Obama aide that the president was detached and listless—playing spades during the Bin Laden raid, outsourcing to Eric Holder the electronic surveillance of Associated Press journalists, letting Lois Lerner weaponize the IRS, and allowing his FBI, CIA, and Justice Department to conspire to destroy Hillary Clinton’s 2016 opponent. Please follow the link to read the entire article. It is beautifully written. The article takes the time to remind us of past events as well as the current lunacy. It also reminds us that although President Trump often refers to some members of the press as ‘fake news,’ he has not followed in the steps of the previous administration by monitoring on the sly the communications of Associated Press reporters or the private emails of a Fox correspondent, or using his Justice Department and FBI hierarchy to delude a FISA court in order to spy on American citizens. President Trump was elected by ordinary people like you and me who decided that we wanted our country back. The elites who like running things their way instead of our way do not approve. We will continue to see evidence of that for as long as President Trump is in office. DaTechGuy is one of my favorite bloggers. He always has insight and an unusual perspective on current events. Recently he hit it out of the park in an article about the recent New York Times opinion piece. ALL WHILE AT THE SAME TIME (according to the NYT) A PERSON OR PERSONS UNKNOWN IN THIS ADMINISTRATION HAS BEEN SECRETLY WORKING TO UNDERMINE HIS EFFORTS. That Donald Trump has compiled the above record of accomplishment while practically the entire media, education, entertainment and elite political culture has fought him AND if the NYT is accurate, Persons or Persons unknown working inside the administration have been actively trying to thwart him, then Donald Trump is undoubtedly the greatest and most successful occupant of the White House since day one period! Or put it another way, if Trump has managed all this with at least one high level saboteur working against him can you imagine what he’d accomplish without a traitor in the house? The NYT doesn’t realize it, but they are asserting that Donald Trump is the most accomplished occupant the White House has ever seen and I guess they’re right. On Friday, Investor’s Business Daily posted an editorial about recycling. Most American communities have made provisions to recycle items rather than just dump them in the landfill, but evidently things are not always what they seem. China used to take about one third of America’s recycled material, but China has put strict rules on what it will accept–generally refusing most of our recycled material. This has resulted in many recycling companies dumping recyclables into landfills. So all of our sorting efforts are for naught. But this isn’t even the worst of it. As John Tierney explained in an exhaustive analysis of recycling programs, also published by the New York Times, recycling is not only costly, but doesn’t do much to help the environment. The claim that recycling is essential to avoid running out of landfill space is hogwash, since all the stuff Americans throw away for the next 1,000 years would fit into “one-tenth of 1% of land available for grazing,” Tierney says. Other environmental benefits, he finds, are negligible, and come at an exceedingly high price. Tierney notes, for example, that washing plastics before recycling them, as is the recommended practice, could end up adding to greenhouse gas emissions. And the extra trucks and processing facilities produce CO2 as well. Since it costs far more to recycle trash than to bury it, governments are wasting money that could be more effectively spent elsewhere. We need to find a way to convert waste into energy without pollution. That might be a pipe dream, but it is a worthwhile goal. Wow. The opinion page of the New York Times today posted an article entitled, “Why This Economy Needs Donald Trump.” The article was written by David Malpass, a senior economic adviser to the Trump campaign. There is no doubt who has the better plan. Our economy is growing at only 1.1 percent per year, a fraction of our average rate, and the Congressional Budget Office forecasts just 2 percent annual growth (in inflation-adjusted gross domestic product) for the next 10 years. Yes, we went through a deep recession, but it ended in 2009. The recovery has been the weakest in decades, and the first that has actually pushed median incomes down. Business investment and profits are lower now than a year ago. Counterproductive federal policies squash small businesses with inane regulatory sprawl that affects hiring, taxes, credit and medical care. The result is a stagnant economy that leaves out millions of Americans who would like to work and get ahead, and a devastating report card on the Obama White House. To restart growth, Mr. Trump would immediately lower tax rates, including for middle-income voters, and simplify the tax code. Americans would be able to exempt average child-care expenses from taxes, and Mr. Trump’s administration would eliminate the death tax, which falls especially hard on some small businesses and farmers. The article goes on to explain that simplifying the tax system while reducing corporate taxes and eliminating or capping many tax deductions would make us more competitive in the world market and create jobs in America. Mr. Malpass contrasts this with Hillary Clinton’s plan to raise taxes, creating an noncompetitive corporate tax rate and discouraging investment with higher estate and capital gains taxes. Obviously Mrs. Clinton is not familiar with the Laffer Curve. 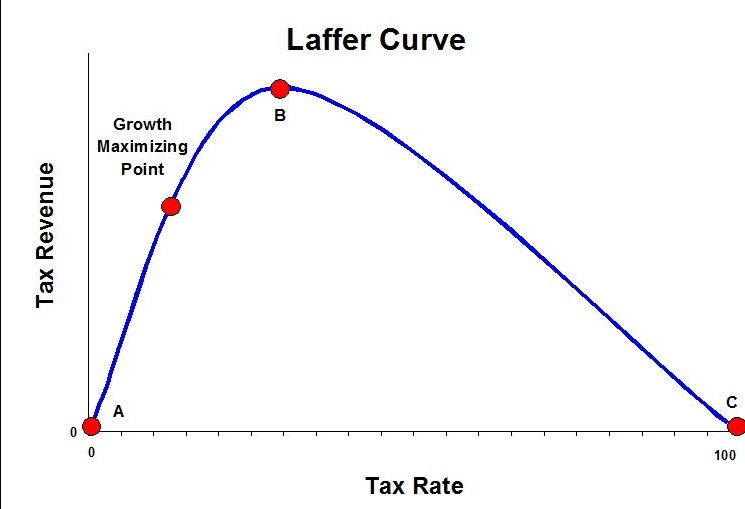 This is a picture of the Laffer Curve. What the curve illustrates is that there is a point of no return in raising taxes where increased taxes no longer result in increased revenue. Mr. Malpass also points out that Donald Trump wants to halt the negative impact of federal regulations on business. These regulations represent a hidden tax that increases the cost of doing business so that the consumer is forced to pay higher prices for goods. Government overreach is expensive. Voters will have an opportunity to decide for or against a government that’s failing on health care, taxes, trade, cost control and regulation. One candidate wants higher tax rates. The other would lower them. One candidate thinks the economic recovery has been successful whereas the other thinks it left millions of Americans out. One candidate has spent her lifetime seeking the presidency. Mr. Trump hasn’t. As Thomas Jefferson said, “A little rebellion now and then is a good thing, and as necessary in the political world as storms in the physical.” It’s time for one now. Front Page Magazine reported yesterday that CAIR (Council on American-Islamic Relations) coordinated its response to the terrorist attack in Garland, Texas, with the American Civil Liberties Union (ACLU). The stated purpose (although in reality this is not necessarily the case) of the ACLU is to protect the civil liberties of Americans. I would assume that those civil liberties include free speech. So it was that on Sunday night, Ms. Salem (Alia Salem, the executive director of the Dallas and Fort Worth chapter of the Council on American-Islamic Relations) was at a festive interfaith women’s event with hundreds of Jewish, Christian and Muslim women when she received a text message from a friend saying that two gunmen had been shot and killed while attacking the center where Ms. Geller was hosting her event. First, Ms. Salem said, she started to cry, fearing news of more deaths. Then she took calls from those she views as allies — other Muslim advocates, a Methodist minister, an organizer for the American Civil Liberties Union — to come up with a response that would walk a fine line: clearly condemning the extremists behind the attack, while also calling to account what they see as hatred decked out in free speech finery. I know this may come as a shock to some people, but there is no law against hatred. There is also no reason to see a draw Mohammed contest as hatred–it is simply an exercise of free speech. The exercise of free speech is part of American law. If Muslims want to speak freely, they need to extend that right to those around them. If they don’t support free speech, I suggest they live somewhere other than America. You don’t normally denounce someone after they were nearly killed in an attack by your people, but that’s exactly what was going on here. As with Rushdie and Charlie Hebdo, elements of Muslim organizations that weren’t openly shouting “Death to America” instead doubled around to destroy sympathy for the targets of the terrorists. And Salem is now pushing the ‘incitement’ line whose goal is to criminalize criticism of Islam. The ACLU’s organizer is apparently okay with that. The New York Times swiftly spins this into Muslims being persecuted by being denied the power to impose Sharia law. Denying the power to oppress women is not usually considered oppression by the left… but there’s a special exception in there for Muslims. I sense a double standard. The Weekly Standard posted an article yesterday about a New York Times article about the University of Virginia’s Miller Center‘s newly released oral history project about the Clinton presidency. Well, today the New York Times has a front page feature on the newly released oral history project about the Clinton presidency. The one the Clintons helped pay for. But nowhere in the 2,600 word piece do Times writers Amy Chozick (who is on the Clinton beat) and Peter Baker (longtime White House reporter) disclose the obvious conflict of interest. No other presidential foundation has given money to the Miller Center, according to a search of the database Foundation Search. The article lists the grants given from the William J. Clinton Foundation to the Miller Center. It has become obvious in recent years that the William J. Clinton Foundation serves William J. and Hillary R. Clinton and little else. On August 13, 2013, The New York Times posted an article detailing concerns about the Clinton Foundation. Soon after the 10th anniversary of the foundation bearing his name, Bill Clinton met with a small group of aides and two lawyers from Simpson Thacher & Bartlett. Two weeks of interviews with Clinton Foundation executives and former employees had led the lawyers to some unsettling conclusions. The review echoed criticism of Mr. Clinton’s early years in the White House: For all of its successes, the Clinton Foundation had become a sprawling concern, supervised by a rotating board of old Clinton hands, vulnerable to distraction and threatened by conflicts of interest. It ran multimillion-dollar deficits for several years, despite vast amounts of money flowing in. I am hoping that Hillary Clinton will not run for President. The Clintons have a history of playing right at the edges of the law, and there have been questions as to whether or not they have on more than one occasion stepped over the edge. We need honest, transparent people in Washington. I don’t believe that Hillary Clinton fits that description. 1. NYT says Obama plans to sidestep Congress on an Iran deal. An October 19th article in the New York Times stated that the Obama administration “will do everything in his power to avoid letting Congress have a vote” on a final nuclear deal with Iran. 2. Do Iran’s recent steps to dilute some of its enriched uranium mean Tehran is serious about reaching a deal on its nuclear program? This question is based on a Monday Reuters report that a new IAEA report said Iran diluted 4,100 kg of 2% enriched uranium to the natural uranium level (0.7% uranium-235). The article at the Center for Security Policy points out that a September 2014 IAEA report specified this was a separate batch from Iran’s 12,464 kg of reactor-grade uranium (enriched to 3 to 5%). Iran can still make 7-8 nuclear weapons from its reactor-grade uranium stockpile if this uranium was further enriched to weapons-grade. 3. New U.S. Concessions. The Iranian news service Mehr reported this week that the Obama administration has offered to allow Iran to operate 4,000 uranium centrifuges. Iran is using centrifuges to enrich uranium to reactor-grade and could easily adapt them to enrich to weapons-grade. Iran has 19,000 centrifuges but only about 9,000 are currently operational. If this report is true it is consistent with previous reports of U.S. offers allowing Iran to operate 1,500-4,500 centrifuges if it converted any uranium it enriched to uranium power. As I explained in an October 2 National Review Online article, these previous concessions would do little to stop or slow Iran’s pursuit of nuclear weapons. 4. Dennis Ross Thinks There Could be a Partial Nuclear Deal with Iran. Ross thinks a partial deal which “contains” Iran’s nuclear program and prevents Tehran from moving closer to a nuclear “breakout” capability – the ability to produce enough weapons-grade fuel for one nuclear weapon – would be a good outcome for the nuclear talks. Ross says this might also be achieved by a “muddling through” strategy under which Iran would agree to limit its nuclear program and the West would not impose additional sanctions. Under such a scenario, the nuclear talks would be suspended for a few months but bilateral talks with Tehran would continue….The current understandings with Iran allow Tehran to continue to enrich uranium and keep a huge stockpile of reactor-grade uranium which could be used to fuel 7-8 nuclear weapons if this uranium was enriched to weapons-grade. Iran also has been permitted during this year’s nuclear talks to install new centrifuge designs that may be four to 16 times more efficient. These are unacceptable concessions that Ross is proposing be made permanent under a partial deal with Iran or through a muddling through strategy. America has not yet prevented a country that desires to obtain nuclear weapons from going nuclear. I suspect that we will not be able to prevent Iran from going nuclear. Unfortunately, the change in the balance of power in the Middle East that would result from Iran going nuclear is not a pleasant one. Yesterday the Daily Caller posted an article about a recent statement by the Environmental Protection Agency (EPA) Administrator Gina McCarthy. McCarthy is referring to the EPA’s proposed rule that would limit carbon dioxide emissions from existing power plants. The agency says the rule will not only help fight global warming, but will also improve public health as coal-fired power plants are shuttered. McCarthy, however, put special emphasis on how the rule would reduce asthma rates, which affect African-American children. If we have any doubt that the climate-control movement was the new home of the communists and socialists, the above statement by Ms. McCarthy should remove all doubt. The article reminds us that the disruption in the economy would hit the very people the movement claims to be helping the hardest. The higher energy costs would impact small businesses, causing people to lose their jobs. Lower paid and unskilled workers would be impacted. Low income people would be devastated by higher energy costs. Wealth redistribution never accomplishes anything good. It simply makes more people poor. It also allows certain people who are in control to be immune from having their wealth redistributed. Generally speaking, it is a really bad idea. Socialist and communist countries have a much lower standard of living than countries where people are free and have property rights. To move in the direction of socialism or communism is to move toward poverty–not toward economic equality or freedom. This graph is from an article in Tuesday’s New York Times. It has to do with the reporting of civilian casualties in Gaza. 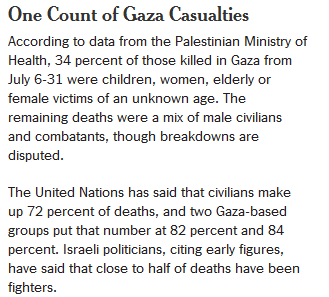 The Times analysis, looking at 1,431 names, shows that the population most likely to be militants, men ages 20 to 29, is also the most overrepresented in the death toll: They are 9 percent of Gaza’s 1.7 million residents, but 34 percent of those killed whose ages were provided. At the same time, women and children under 15, the least likely to be legitimate targets, were the most underrepresented, making up 71 percent of the population and 33 percent of the known-age casualties. We need to remember that Hamas soldiers do not always wear uniforms. Those infiltrating Israel through the tunnels wore IDF uniforms. As has been previously stated, Hamas routinely puts rocket launchers in heavily populated civilian areas. That is part of their strategy in the propaganda war. Now that the journalists are leaving Gaza, they are reporting rockets being fired from directly under their hotel rooms and in civilians areas. The world needs to understand the propaganda war being waged by Hamas and not fall prey to the misinformation that is being reported. I was stationed in Gaza, and covered the Palestinian side of the war where you saw most of the casualties. One of the reasons for that is because the Hamas fighters are living among the civilian population. . . . This is a situation where the fighters fire rockets from all over the Gaza Strip, from neighborhoods to cemeteries, from parking lots, from any number of places. Hamas fighters are not able to expose themselves. If they were to even step a foot on the street they would be spotted by an Israeli drone and immediately blown up. We don’t see those fighters. They are operating out of buildings and homes and at night. Israel is fighting a terrorist neighbor. The world has a choice. They need to understand that this is a fight against terrorism and for democracy. They can choose to help Israel or they can ignore what is going on. The problem with ignoring what is going on is that the terrorists in Gaza are not a unique entity. They are linked (at least in philosophy) with Al Qaeda, Boko Haram, ISIS in Iraq and Syria, etc. We allow them to continue ruling Gaza at our own peril. A website called Legal Insurrection posted an article yesterday about the lack of reporting in the mainstream media about the activities of Hamas. Over the last dozen years I made 13 trips to Baghdad to lobby the government to keep CNN’s Baghdad bureau open and to arrange interviews with Iraqi leaders. Each time I visited, I became more distressed by what I saw and heard — awful things that could not be reported because doing so would have jeopardized the lives of Iraqis, particularly those on our Baghdad staff. For example, in the mid-1990’s one of our Iraqi cameramen was abducted. For weeks he was beaten and subjected to electroshock torture in the basement of a secret police headquarters because he refused to confirm the government’s ludicrous suspicion that I was the Central Intelligence Agency’s Iraq station chief. CNN had been in Baghdad long enough to know that telling the world about the torture of one of its employees would almost certainly have gotten him killed and put his family and co-workers at grave risk. That is the way thugs in the Middle East handle reporters. Things have not changed–that is the modus operandi used by Hamas. The Times of Israel confirmed several incidents in which journalists were questioned and threatened. These included cases involving photographers who had taken pictures of Hamas operatives in compromising circumstances — gunmen preparing to shoot rockets from within civilian structures, and/or fighting in civilian clothing — and who were then approached by Hamas men, bullied and had their equipment taken away. The article at Legal Insurrection included tweets from reporters and stories of intimidation of reporters. The reason we are not hearing both sides of the story of the Gaza-Israeli war is that one side is a bunch of thugs who are endangering their own civilian population and doing everything they can to hide the truth. After years of harassment by special interest groups, Walmart is fighting back. As with most bullies, the claims they make have less to do with reality than with bolstering the tormentor’s self-esteem. Responding to the NYT hit piece, Walmart’s David Tovar, Director of Corporate Communications, reposted Egan’s article, complete with snarky, red-inked edits in the margins. He began, “Thanks for sharing your first draft.” Tovar proceeded to dispute claim after baseless claim. It reminded me of the triumphant scene in “Napoleon Dynamite,” where the relentlessly mistreated protagonist earns a standing ovation for his dance moves. With 2.2 million employees worldwide, Walmart is also the largest U.S. employer. The average full-time associate earns around $12 an hour, well above minimum wage. In 2013, the corporation was praised by First Lady Michelle Obama for announcing plans to hire 100,000 veterans. Last year they donated more than $1 billion to charity globally. They also offer education assistance and help associates who have been affected by catastrophic life events such as fire, divorce, death, etc. In the wake of Hurricane Sandy, the retailer sent truckloads of goods to help victims. Yet, their reputation is under constant attack. The Washington Examiner reported that Walmart’s health insurance is not only more affordable than Obamacare, but it also offers better coverage, minus the income, age or gender restrictions. The retailer revolutionized the pharmacy industry by offering inexpensive prescription drugs with little to no co-pays for their employees. Still, nothing satisfies the bullies, intent on pushing Walmart down and taking their lunch money. Walmart is known for their entry level positions. But starting wages are rarely static. According to their website, “About 75% of our store management teams started as hourly associates, and they earn between $50,000 and $170,000 a year … Last year, Walmart promoted about 170,000 people to jobs with more responsibility and higher pay.” This is a key point lost on the Walmart bashers — as people gain knowledge and experience they climb the economic ladder. Today’s trend is to be obsessed with the gap between the highest paid worker and the lowest. Of course there’s an income gap! But, we must also take into account the gap in initiative, experience and in some cases, education (all of which can be rectified). These things being equal, we could legitimately criticize the income disparity. If career politicians and intellectual elites had even a smidgen of experience in the private sector, they might understand how this works. Until then, they shouldn’t be allowed anywhere near economic policy. Call me old-fashioned, but I miss the days when we valued hard work and success in this country. Young people today are encouraged to vilify those who have more. It seems to me a childish and selfish way to view the world. In my youth, I had many low paying jobs. When I got tired of being broke, I applied for student loans, studied hard and became a nurse. If I wanted more money, I could go back to school and become a nurse manager or even a surgeon. Here’s the thing: I don’t want to. I’d rather not put forth the effort or incur the associated expense. Do I resent doctors because they make more than me? Not at all. Do I march in the streets and demand the same salary as a physician? That would be absurd. Instead of browbeating Walmart and coveting thy neighbor’s paycheck, maybe we should be inspiring people to educate and market themselves so they have skills employers need. I learned early in life that no one is going to pay me to sit around looking pretty. 1 The Israeli military said it had uncovered about two dozen tunnels with more than 60 access points, many of them in this Gaza City neighborhood where there has been some of the most intense fighting. 2 In early July, the Israeli Air Force struck a tunnel that led to this kibbutz, near where Gilad Shalit, an Israeli soldier, was captured in 2006. 3 Hamas gunmen emerged from a tunnel about a mile from this kibbutz last Thursday. Israeli officials cited this as the final straw before the ground invasion. 4 Eight Palestinian militants emerged from a tunnel near here on Saturday, armed with automatic weapons and wearing Israeli military uniforms. 5 A deadly battle ensued between Israeli troops and Hamas militants on Monday after the militants emerged from a tunnel about 500 yards from this community’s homes. 6 Some of the militants tried to make their way here. 7 Residents of this kibbutz were warned to stay inside. There is no way Israel can stop fighting until all of the tunnel network is destroyed. Any call for a cease fire without the destruction of the tunnels will result in a continued attack on Israeli civilians. The world generally ignored the rocket attacks on Israeli civilians as they continued over the years. We cannot ignore the attacks that would come from the tunnels if the tunnels were left intact. The video can be found at YouTube. Just as America and its allies had to defeat Germany completely to stop Hitler, the Israelis will have to defeat Hamas and other terrorists whose goal is to eliminate Israel completely. Until that happens, Israel will have to defend herself against those who attack settlements and kill civilians. This is a link to an article at The Blaze. The article shows a letter written by David Tovar, Walmart’s VP of corporate communications for Walmart to New York Times columnist Timothy Egan after Mr. Egan posted an article that attempted to smear Walmart. Please follow the link to read the reply. It is an example of the correct way to respond to a smear attack. This post is one I don’t like writing. It reminds me of the phrase, “Just because you are paranoid, it doesn’t mean that someone isn’t out to get you.” I hate conspiracy theories. My brain isn’t complicated enough to put all the pieces together, but after a while it becomes difficult to ignore a recurring pattern. The following is from a 2005 article posted at Discover the Networks. It explains the Cloward Piven approach to bringing about social change. First proposed in 1966 and named after Columbia University sociologists Richard Andrew Cloward and Frances Fox Piven, the Cloward-Piven Strategy seeks to hasten the fall of capitalism by overloading the government bureaucracy with a flood of impossible demands, thus pushing society into crisis and economic collapse. Inspired by the August 1965 riots in the black district of Watts in Los Angeles (which erupted after police had used batons to subdue an African American man suspected of drunk driving), Cloward and Piven published an article titled “The Weight of the Poor: A Strategy to End Poverty” in the May 2, 1966 issue of The Nation. Following its publication, The Nation sold an unprecedented 30,000 reprints. Activists were abuzz over the so-called “crisis strategy” or “Cloward-PivenStrategy,” as it came to be called. Many were eager to put it into effect. So how is this relevant to what is happening today? At some point when you examine the Obama Administration, you have to decide whether the failed policies are simply the result of a political ideology that doesn’t work, poor administration skills, or if they are by design. I am coming to the conclusion that they are by design. Yesterday Human Events posted a story about the crisis of unaccompanied children pouring into America through our porous southern border. Let’s look at the impact of the Obama Administration on medicine and medical insurance in America. Premiums are skyrocketing while it is becoming more difficult to obtain care in a timely manner. It is very possible that ObamaCare will put medical insurance companies out of business and the insurance industry will not be able to be rebuilt after the disaster that is coming. The medical system will be overloaded with people who are not able to obtain care. I don’t know if America will recover from the Obama Administration. If we do recover, it will be a long and difficult road back to prosperity. President Reagan was able to walk that road after one term of Jimmy Carter, but Jimmy Carter did not do the structural damage to America that President Obama is doing. Electing Republicans in November may lessen the damage, but when you consider President Obama’s lack of respect for the U.S. Constitution, his leaving office in January 2017 and being replaced by someone who does not share his political philosophy is really the only hope left for America. Today’s New York Times is reporting that the Census Bureau, an agency which President Obama brought into the sphere of the White House, is changing the way it reports health insurance date. The change will make it more difficult to measure the impact of ObamaCare in the report due out this fall. “We are expecting much lower numbers just because of the questions and how they are asked,” said Brett J. O’Hara, chief of the health statistics branch at the Census Bureau. Can you pick out the taking points? This will, of course, mute the effectiveness of attacks on ObamaCare in the fall election. The latest example of the use of this rule is the political left’s attack on the Koch Brothers. Open Secrets has posted a list of the top donors to Republicans and Democrats from 1989 to 2014. It is not really a surprise to me that you have to go down to number 17 to find a donor who donated more to the Republicans than Democrats. Koch Industries, the organization liberals love to cite as the buyer of elections, is number 59 on the list. Well, the Koch Brothers are speaking out, and John Hinderaker Power Line posted the story yesterday. It is disappointing, but not surprising, to see the NY Times become the launch pad for Senator Reid’s and his allied group Patriot Majority USA’s most recent dishonest and desperate attack campaign against Charles Koch and David Koch. It was very surprising, however, to see the Times’ headline that this was a “new strategy” by the Democratic leadership. For the past several years, the Times has been reporting and opining, and sometimes joining in, the attacks against us. This is a living example of Saul Alinsky’s Rules for Radicals Rule No. 12. Indeed. It is revealing to compare Charles and David Koch with the owners and managers of the New York Times Company. The Koch brothers employ a growing, highly-paid work force of 60,000 in the United States, around one-third of whom are unionized. Koch Industries enjoys excellent relationships with its unions. The New York Times Company, on the other hand, employs a shrinking, largely ill-paid work force, and is embroiled in a long-running feud with its unions. Koch Industries and its subsidiaries produce tangible products that enrich the lives of Americans–among other things, Koch transports and refines oil, makes products that are used in construction, and manufactures a wide array of consumer products that are staples in most American homes. The New York Times Company produces nothing but shoddy left-wing journalism that is of questionable benefit to anyone. This is not a Republican or Democrat issue. The issue here is what Americans want from their politicians and media. We can have a media that is objective and tells voters what they need to know to make informed choices, or we can have a media that lies to us and attacks people in a partisan way. The destruction of an honest man running a successful business does not do anyone any good. It is harmful to our representative republic. If Americans want honest news sources, they need to stop buying newspapers from sources that are not helpful to the political debate. We all need to support the sources telling the truth, and let the sources not telling the truth deal with a pile of unsold newspapers. ESPN and other news outlets are buzzing today about Michael Sam, an All-American defensive lineman from Missouri and the Associated Press‘ SEC Defensive Player of the Year. Michael Sam has announced that he is gay. Mr. Sam, no offense, but I really don’t care. My question is, “Would the press make this much fuss if a football player announced that he was celibate because he was a Christian?” Either way, it’s more information that I need. I wish Mr. Sam the best in his career, and I hope that he is treated fairly. Other than that, this really is more information than I need, and it is none on my business. Yes, government can actually work. You haven’t heard about this one example because it really does not illustrate what the media wants illustrated, but government can work. Yesterday The Blaze reported on some comments made by Rush Limbaugh about what is happening in Wisconsin. You haven’t heard much about this, but the state has done an amazing turn around. The state of Wisconsin’s unemployment rate is “rapidly falling” and the government’s budget ended the year with a $912 million surplus, Limbaugh explained. He says the dramatic turnaround is due in large part to the conservative policies of Gov. Scott Walker. What’s even more amazing, he continued, is the fact that Walker is going to “rebate the money in the form of tax cuts to the people, who he said own the money.” Limbaugh says the news is “earth-shattering” because, in one of the bluest states, Walker was targeted for removal twice but continued to implement conservative policies that he was confident would help his state — and his strategy appears to be working. If you think back a little bit, you remember what Governor Walker went through to implement his plans for the state. He had protestors trashing the capitol, he survived recall elections, and personal attacks, but he just kept on moving forward. “He’s going to cut income taxes and property taxes, and he made the point that it’s not just a gimmick of budgeting or accounting. It’s the result of serious, significant policy changes,” Limbaugh argued. “And to me, for us as conservatives, Wisconsin and Governor Walker, I mean, everything that we want to happen, happened there,” the radio host concluded. When government is done right, unemployment goes down, taxes go down, and everyone gains. When government is done wrong, unemployment goes up, taxes go up, the number of people receiving food stamps goes up, and everyone loses. It is, in the long run, up to the voters to decide what they want. Walker is proposing a $504 million property and income tax cut plan as a means to return some of the surplus money to the people of Wisconsin. Some Democrats and Republicans are already criticizing the plan and are calling for changes. However, some lawmakers are concerned that Walker’s tax cut plan would increase the state’s projected budget shortfall from $700 million to $800,000 million. The Republican governor argues the estimates don’t take into account any revenue growth, which he says will cover the difference. The unemployment rate in Wisconsin dropped to 6.2 percent in December and has been dropping steadily since 2011. A $912 million surplus, turns into a projected $700-$800 million deficit … a $1.6 Trillion negative shift. Somehow that sounds like Reagan era traditional GOP math and economics … Where are the Tea Party and their idea of cutting deficits? This guy seems to be creating a massive one, and, naturally, Rush doesn’t see it. A 6.2% unemployment rate doesn’t leave much room for growth in the economy. To wipe out that $1.6 Trillion negative shift, the state would need to get to nearly zero unemployment. Embed TheBlaze Headlines on Your Own Site! What do blood moons have to do with Israel?